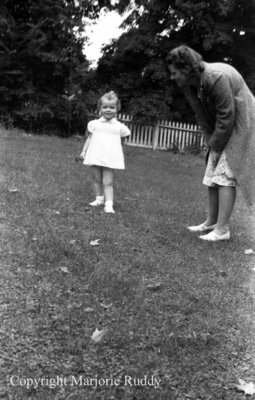 A black and white negative of an unidentified child standing on grass. The child is wearing a dress and facing the photographer. An unidentified woman is bending over towards the child. The woman is wearing a dress with a long jacket over top. A fence is visible in the background. Unidentified Woman and Child, October 1941, Marjorie Ruddy. Whitby Archives A2013_040_968A.